(March 14, 2015) TWO Capital Partners has submitted Rezoning Petition No. 2015-045 to allow the construction of up to 291 apartments on 16.98 acres on the southwest corner of Sandy Porter Road and Brown-Grier Road. Representatives of the petitioner will be holding a Community Meeting on Wednesday, March 18 at 7:00 PM at Steele Creek Presbyterian Church (7407 Steele Creek Road, in the Billy Watt Room). The largest portion of the property, on the corner, currently is zoned for a day care center and 31 townhomes. (See Rezoning Petition No. 2008-111.) Three additional parcels currently are zoned R-3 (Residential, 3 units per acre). There currently are several single-family houses on the site, some in disrepair. The new zoning requested is UR-2(CD) (Urban Residential Conditional District), which would allow up to 291 apartments for rent. This use is inconsistent with the Steele Creek Area Plan, which calls for low density residential development of up to four dwelling units per acre. The Community Meeting provides area residents with an opportunity to learn more about the developer's plans and to provide feedback. Residents also will have an opportunity to speak at a Public Hearing before the Charlotte City Council. 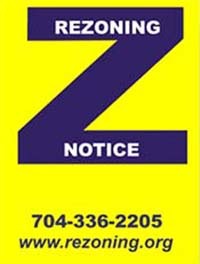 This currently is scheduled for the City Council's monthly rezoning meeting on April 20 at the Charlotte-Mecklenburg Government Center. This Petition involves a request to rezone a 16.98 acre Site from R-3 (Single-Family Residential), R-8MF(CD) (Multi-Family Conditional District), and INST(CD) (Institutional Conditional District) to UR-2(CD) (Urban Residential Conditional District) to allow the Site to be developed with a residential community with up to 291 high quality multi-family residential dwelling units. A portion of the property, approximately 7.8 acres, was rezoned in 2008 to allow the development of a large child care center and 31 townhomes. This rezoning request proposes to develop the area previously rezoned plus an additional 9.2 acres with up to 291 high quality multi-family residential dwelling units. The proposed residential dwellings units will be arranged on the Site in a combination of three story and two story buildings. The majority of smaller two story buildings will be located on the perimeter of the Site adjacent to existing single-family uses. The three story buildings will be located on the interior of the Site or along Sandy Porter Road and Brown Grier Road. Adjacent to the homes in the Griers Fork neighborhood, and along the western property boundary, a 50 foot Class C Buffer will be provided. Portions of this buffer will also be used as a tree save area. A black vinyl coated chain link fence will also be provided in the area of the Site that abuts the Griers Fork Neighborhood. Access to the Site will be from Brown-Grier Road and Sandy Porter Road. These access points will be constructed as new public streets that will extend through the Site. Sandy Porter Road and Brown-Grier Road will be improved with curb and gutter, eight (8) foot sidewalks and street trees. Sidewalks and street trees will also be provided on the interior of the Site along the new public streets. Direct questions to Keith MacVean (704-331-3531) or Jeff Brown (704-331-1144) of Moore & Van Allen.